Krista Martynes, clarinets in a concert with works for clarinet, bass clarinet and live-electronics by Aaron Einbond, Karlheinz Essl, Edison Denisov, Adam Basanta, Ana Sokolovic Mesh and David Lang. Krista Martynes proposes a music program for clarinet, bass clarinet and live electronics entitled Electric Licorice. It comprises mostly of recent works by European and American composers and media artists and put forward a panorama of contemporary interpretations and approaches to musical composition. The clarinet is among the ideal musical instruments serving this aim. Its technical and expressive potential, its flexibility, the versatility, the extensive ambitus and the range of its dynamics have made it the preferred choice for many composers coming from entirely different aesthetic views. From the clarinet family, the bass clarinet is amongst the most distinctive. Its dark timber and its rich harmonics, resonate with a particular aspect of contemporary music aesthetics. These properties are multiplied by its fruitful encounter with electronic technology. In this concert, Krista Martynes alternates works for bass clarinet and live-electronics with works from the noteworthy and rich repertoire for solo clarinet. The pieces of the program underline, amongst other things, the natural presence of the instrument and the performer, the breath, the key’s sound, the response of the acoustic tube. With unquestionable musical sensibility, they are articulated in a entity that surpasses its parts, where with any well-assimilated references to the idioms of popular music, it invites the unfamiliar listener to an exciting, "delicious" and demanding musical experience. Krista Martynes is a clarinetist and multi-media artist. Thanks to her double capacity she has achieved in giving new life to numerous new and standard repertoire works. Furthermore, her creative approach of improvisation has enhanced her already very wide performing spectrum. Krista performs as a soloist, as well as member of various ensembles (NEM, Ensemble Modern, Klangforum Wien and Ensemble Chorum) and orchestras and has participated in numerous important festivals (Acanthes 2005 and 2006, Musikprotokoll and Transart Festival, Italy, Klangspuren Festival, Austria, New Ways Sound Festival, St Petersburg, Russia 2010) and many concerts worldwide. She has collaborated with important contemporary music composers, such as Giorgos Aperghis, Pascal Dusapin, Gerard Pesson, Wolfgang Rhim, Hector Parra, Vassos Nikolaou, Paul Mefano, Jorg Widmann, Zad Moultaka and Philippe Leroux, while she has also commisioned the composition of numerous musical pieces. 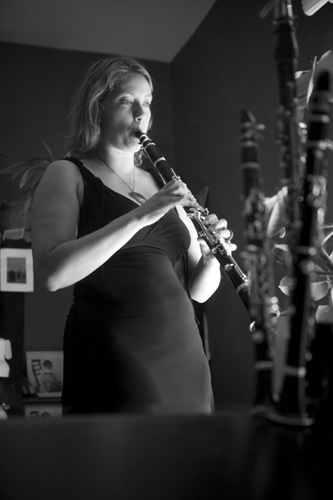 Krista pursued her studies next to great clarinet players, such as Thomas Freidli, Hans Deinzer, Philippe Cuper, and has attended master-classes by Ernesto Molinari, Suzanne Stephens, Wes Foster and Joquim Valdepenas.